Construction of HOLA radiators is divided into assembled two-line ribbed tube radiators and brazed single-line corrugated fin radiators. Construction of radiators depends on each vehicle heat exchange and arrangement requirements. Tanks are made from advanced nylon materials and connected to radiator core mechanically through special rubber sealing. 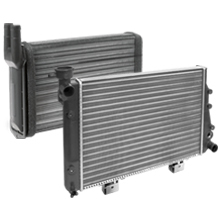 HOLA radiator elements are resistant to cooling fluids, fuel, salt fog and wet environment. Different construction solutions allow to reach better efficiency depends on driving conditions: stationary traffic, cross country and mountains driving, goods transportation. Full proofness due to tank connection with frame through rubber sealing. Designed service life at least 3 years or 100 000 km mileage*.